When a person dies without a will, legal issues usually arise as to who has title over the property. An Affidavit of Heirship is a legal document that is used in this instance and helps the heirs avoid going through probate. Ownership of real property can be transferred to the heirs very quickly using an Heirship Affidavit. Heirship Affidavits are mainly used in situations in which a person died without leaving a will and the bulk of the assets in the estate are real estate. Click here for a list of legal terms that apply to an Affidavit of Heirship. An Affidavit of Heirship must be signed by two witnesses familiar with the Decedent, but do not stand to gain financially from the Decedent’s estate. The witnesses signing the Affidavit state under oath that they knew the Decedent. The location and date of the Decedent’s death is listed on the Affidavit along with his or her heirs. The Decedent’s marital history, wedding date, divorce date and/or the date the spouse died are listed on the Affidavit. The name and current address of the Decedent’s children must also be provided on the Affidavit of Heirship. If the Decedent was never married and did not have any children, the names of the Decedent’s parents should be listed. What is Listed on an Affidavit of Heirship Form? A description of the Decedent’s property. The state and county where the property lies. Name and address of the witnesses. Questions about the relationship of the witnesses to the Decedent. Questions about the Decedent’s will. Questions about the Decedent’s debts and taxes owed. Questions about the Decedent’s family members. Place for Notary signature and seal. 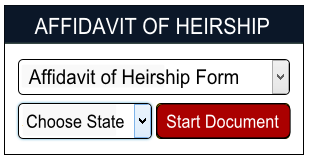 View our sample Affidavit of Heirship form. Where do I File and Affidavit of Heirship form? The person executing an Affidavit of Heirship must swear that the Decedent had no debts at the time of death. The signed and notarized Heirship Affidavit is then filed in the county or parish land records where the Decedent’s property lies. An Affidavit of Heirship is not legally binding until signed and sealed in the presence of a notary public. The notary public is responsible for confirming the identity of the affiants who are signing the Heirship Affidavit by checking their identification. The notary public should now date and sign the Affidavit and seal the Affidavit to complete his or her duties. Once notarized, the Decedent’s heirs assume ownership of the property. At this time, the filed Affidavit of Heirship gives the heirs the right to sell the real estate.